Is THAT what the "D" stands for??? DUAL??? That, by the way, isn't the dual colored ball box, it's the side of the box for the orange colored balls. Anyhoo.. we haven't even touched the orange balls yet, the bi-colored balls were intriguing enough that we opened one of those boxes first, and have had three playing sessions with it at Weekend Social Doubles. And curiously enough, everyone REALLY LIKES THIS BALL. There's a bunch of long pips users, and they're some of the biggest ball critics you've ever come across and they really like the ball. I do too - I think I have a degree of control over this ball that I don't have over the celluloid one. Sunday's session (the latest so far) was very different from some of our other sessions, suddenly everyone was attacking a lot more rather than pushing. Fewer balls in the net, longer rallies overall. I don't know if it was the ball, but I think it did help. I imagine they're exactly the same as the white or orange balls, but the dual color does make them more visible, I think. No, no broken ones yet. The ball hasn't gone soft, either. This is a new vendor for me, first time I bought anything from them. The balls came packed in a very sturdy box with "FRAGILE" and "DON'T CRUSH" labels (actually "NO PRESSURE" ) labels all over them. On top of that the price is really good ($11.10 for 20 balls - the orange balls are the same price). The only complaint - that perforated hole on the side of the box that you're supposed to use to remove the balls is TOO SMALL. Yeah, they are good balls, virtually identical to the first batch of white D40+ which I bought (and am still using). Not ITTF approved, probably because never submitted, but probably 3 star quality. Whether they help to read the spin, which it seems they would, is still moot. Not sure how I feel about the dual balls...I work hard to hide my no spin shots! I heard the orange plastic balls play slow. Let me know what you think. 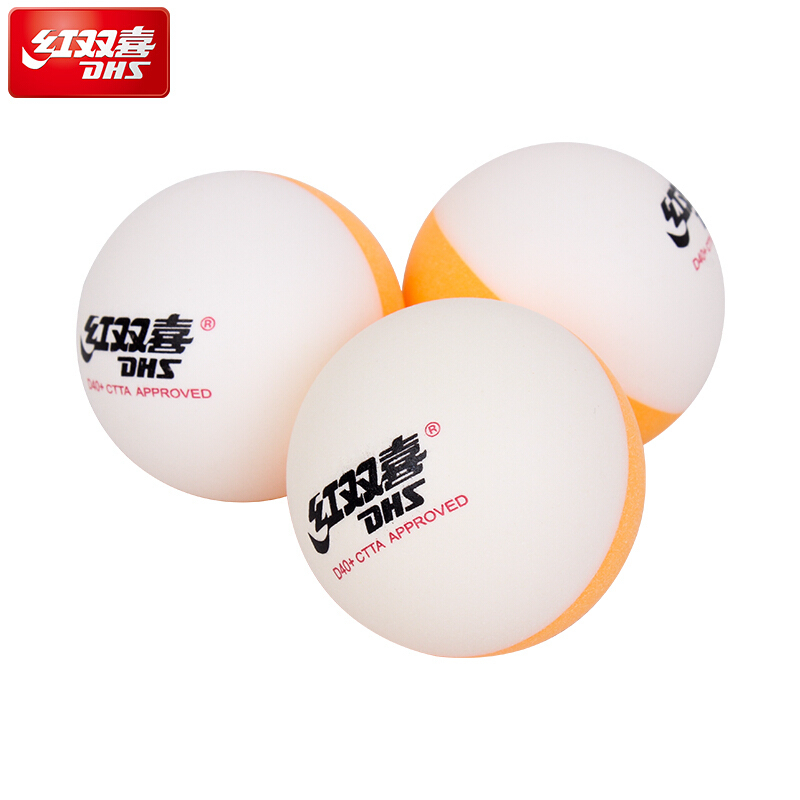 The two color balls don't conform to ITTF rules - balls can either be white, or they can be orange, the rules don't even mention the possibility of half and half. So there's no way they can get approved by ITTF for use in their sanctioned tournaments unless the rule gets changed. 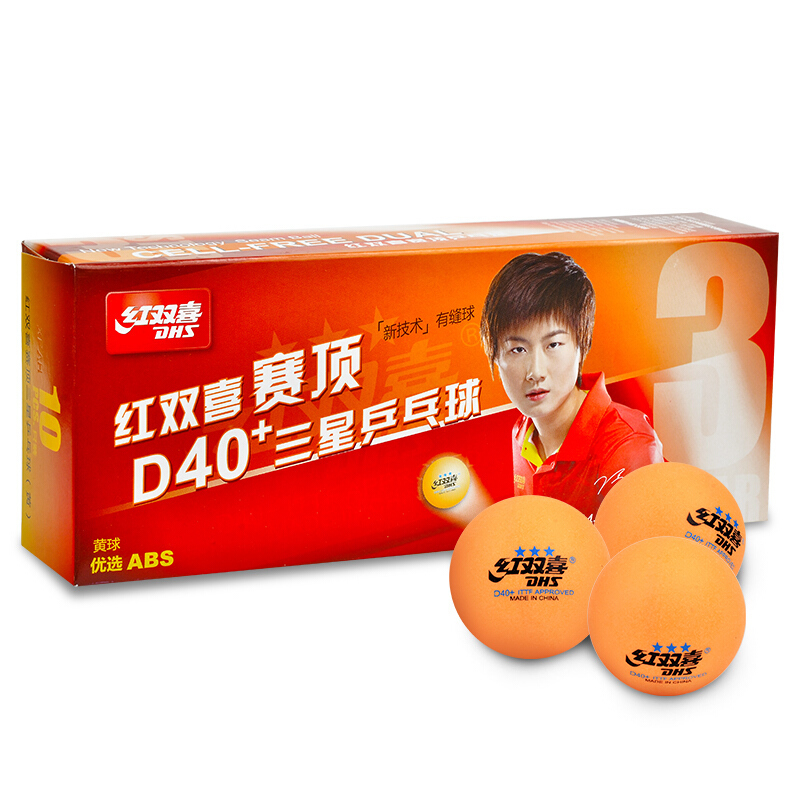 That doesn't mean they're not 3 star quality - they're supposedly used in some Chinese tournaments and in the China Super League (at least, bi-color balls were used some time back) and they're CTTA approved. Don't know why DHS can't slap three stars on them anyhow... I mean, wasn't it Huieson who sells 4 star balls? As far as revealing spin - yeah, it's possible, but that apparently hasn't occurred to the folks at Weekend Social Doubles yet..
By the way, I have a sneaking suspicion the orange color is spray-painted on. I'll find out when we finally break a ball. The orange balls might be the same way. If they found a way to paint the balls without the paint coming off or affecting the surface friction, that might be a good way to avoid whatever deleterious effects that dyeing the actual plastic was having. I have heard from a good source that the orange balls will still be different from the white, and not necessarily in a good way. 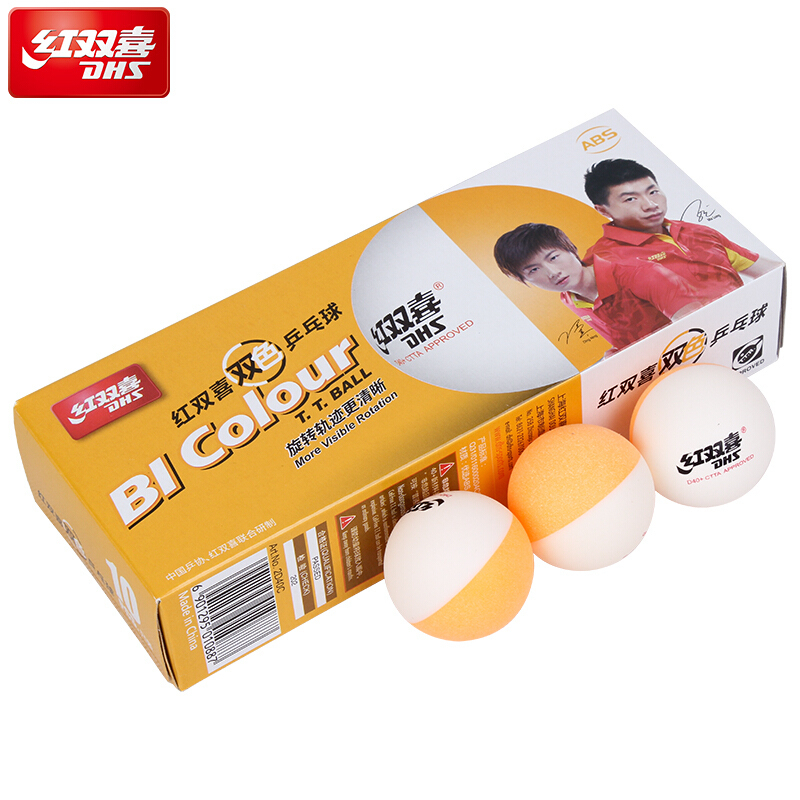 I tried bi-coloured balls from another brand, I suspect they are made in the same factory and identical. They felt hard and heavy, but good quality, not bad balls at all, but no more spinny than the regular D40+, possible a little less. The hard & heavy feels really nice on your bat though. PLASTIC COLORED ? ...NOT IMPOSSIBLE . Making plastic raw material in many varying colours is now feasible, even though with those obsolete machinery, small privat workshops of India, Tailand and so on. Inorganic Food Colorants is oftentimes put into the raw plastic powder during the making process. Some natural carmines would provide flammy orange colour in the finished plastic granulas. Maybe this is why that ball is so well liked here? What was this other brand, by the way? Today I successfully used the visible spin to return some side-topspin and side-backspin serves. I don't think anyone else has caught on yet.. I still managed to serve a few that flew off the table or into the net, myself... I'm not scoring as many points with these since quite a few people now use long pips - generally you don't try these serves against long pips because it kills your doubles partner when the spin comes back. I use them when I know inverted will be used to return the ball, though. Never tried it but I will chop an orange ball in half and report if the inside is orange or white!I might even post some pics if I can. I got a 30 pack of these from an Ebay seller and dumped 27 of them in the white ball bin at work. So far, people mostly notice that they bounce differently from the 40mm cell balls. I have three that I washed and put in my bag for club use that I haven't gotten a chance to really put through their paces yet.